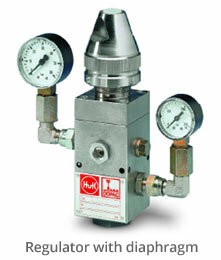 Material pressure regulators are used to reduce and balance material feeding pressure down to the required operating pressure. As well as accurately regulating material pressure, these valves will also compensate for pulsations that occur as a result of the reciprocating action of piston pumps. Pulsations cause a brief decrease in pressure that could lead to a slight reduction in the flow of material. 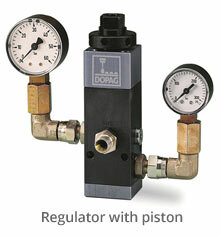 These regulators can be used on materials with viscosities from 5,000 to 500,000 mPa s.
Material pressure regulators reduce the pressure of the delivered material to the required working pressure. Apart from reducing pressure (main function), these valves compensate the pulsations which occur during the material delivery with piston pumps due to the changeover position of the pump. Such pulsations would cause a short-time drop of pressure and lead to a slight reduction of the material flow. In case of small metering quantities, this might impair product quality as especially for such applications an absolutely consistent material flow must be ensured. For use with reactive, moisture-sensitive and also abrasive media, such as epoxy resins and polyurethanes. Sealing of the spring area takes place via a diaphragm. For processing self-lubricating materials such as greases and oils as well as other single and plural component materials. Sealing of the spring area takes place via a glide ring seal. 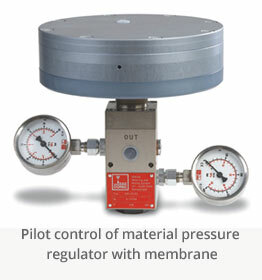 The remote control for a material pressure regulator with diaphragm is especially useful when regulators are located in difficult to access or hard to reach areas. The pilot control enables working pressures easily and separately to be adapted to changing conditions of production or discharge amounts without the need of manual intervention. The working pressure is controlled by fine adjustment of the air pressure being applied to the control diaphragm. This is especially advantageous if the valves are mounted on the system at positions which are difficult to access.